Timeline can be displayed as a simple list of comments or as a media rich stream of content with the ability to share with colleagues via My Field CRM or through social media channels. Embed imageds or documents for instant viewing and sharing. Media Timeline is a feature rich social media style way of recording information and details about your customers and potential leads. A choice of standard list view or media style content can be selected from your preferences depending on how you would like the data presented. There are no limits to the amount of content that can be uploaded to media timeline, this feature is available with 'Field Plus' and above. 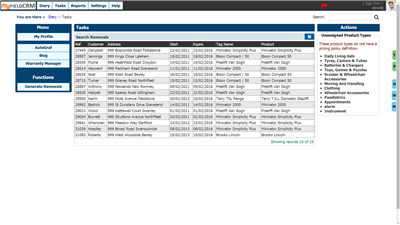 'Field One' packages default to standard view text lists shown in a traditional style grid. What Content Can I Upload? Images are the primary source of content that is uploaded to the Timeline. 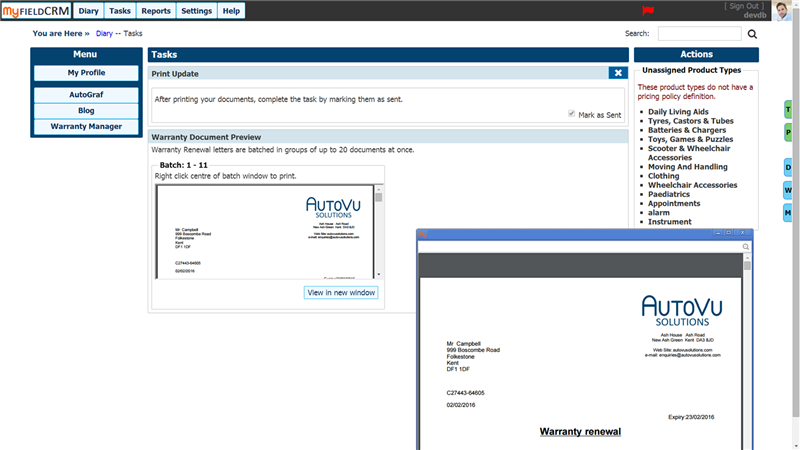 PDF's and other documentation can also be uploaded and viewed simply by clicking on the content icon within the timeline. 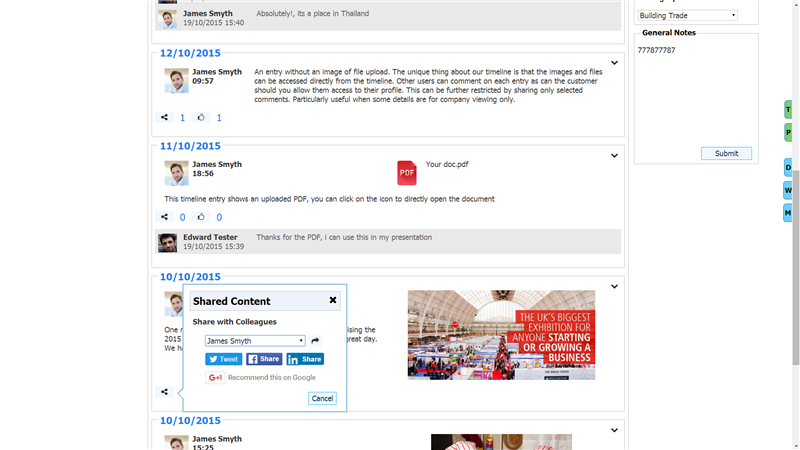 Content and dialogue uploaded to the media timeline can be shared with colleagues within your organisation with notifications sent through email of the content being shared. Updates can also be shared through social media channels and will show as an entry on external timelines. This feature can be limited or removed where required either for the entire organisation or on an individual basis through your settings console. 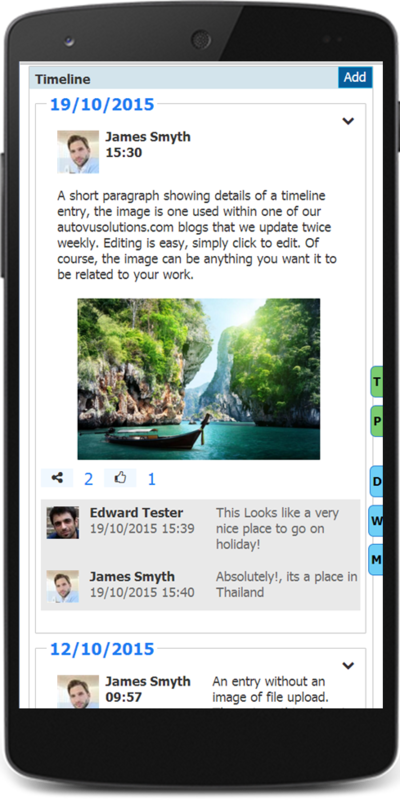 Every detail of communication can be recorded, shared or simply stored away for a later day. 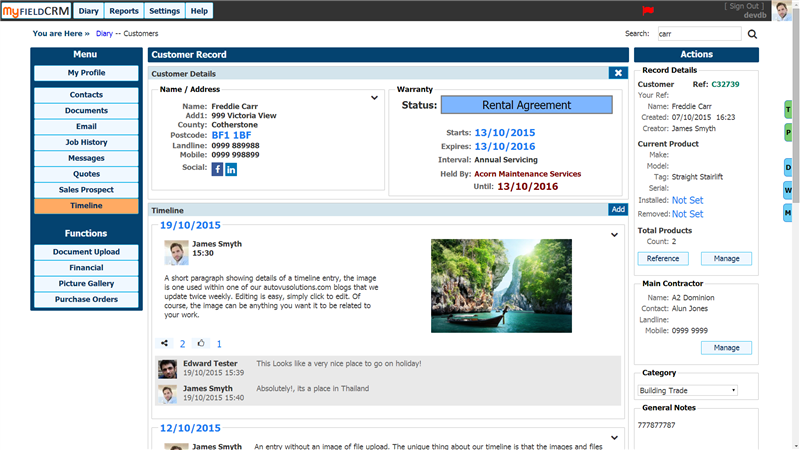 From uploaded images of the site, to documents you may have produced or those sent to you, all of these can be conveniently stored within the customer record. 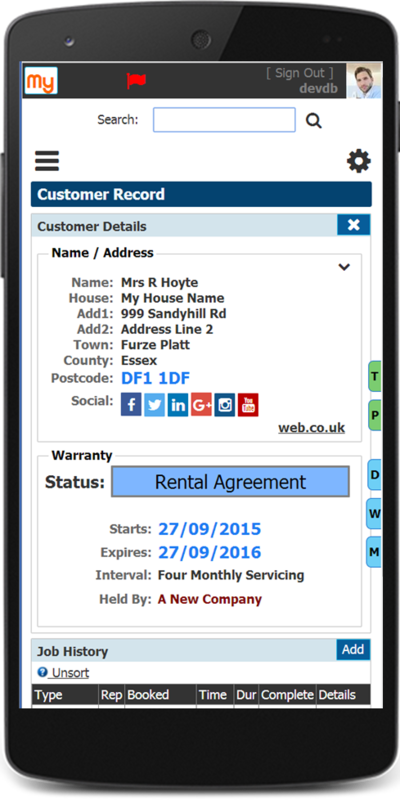 For a detailed view of your appointments and site visit bookings, the customer record shows information about every site visit or sales call, including a timeline of events as they occured. Customer timeline allows simple table view or media rich content view with social integration. Depending on your busines type, this opton can be toggled from simple to advance at the tick of a box. Media content is available for Field Plus and above. If your product comes with a warranty, the customer record can be configured to show details of this the instant you open the record. Complete with a 5 point warranty renewal program, you will never miss the opportunity to gain additional revenue from after sales warranty renewal. Each customer can have an unlimited number of products assigned to their account. This also allows separate billing of each product and a summary view of payments outstanding. Warranty control and product history notes are individually defined. 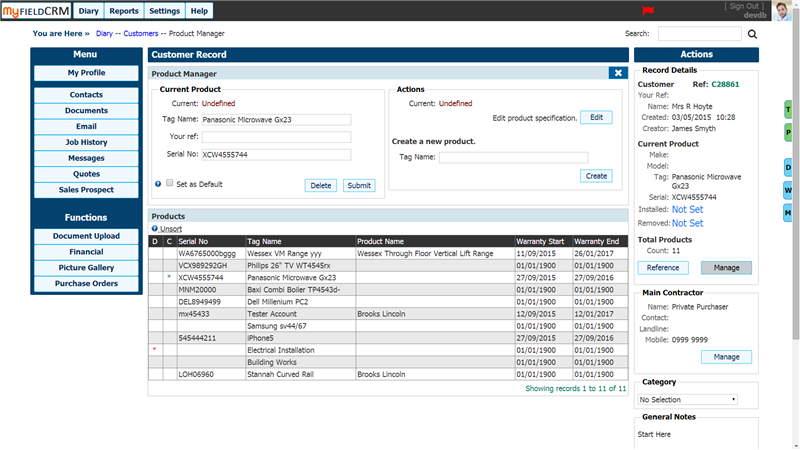 Your customers may purchase many items, logging and tracking these within My Field CRM is done through Product Manager. 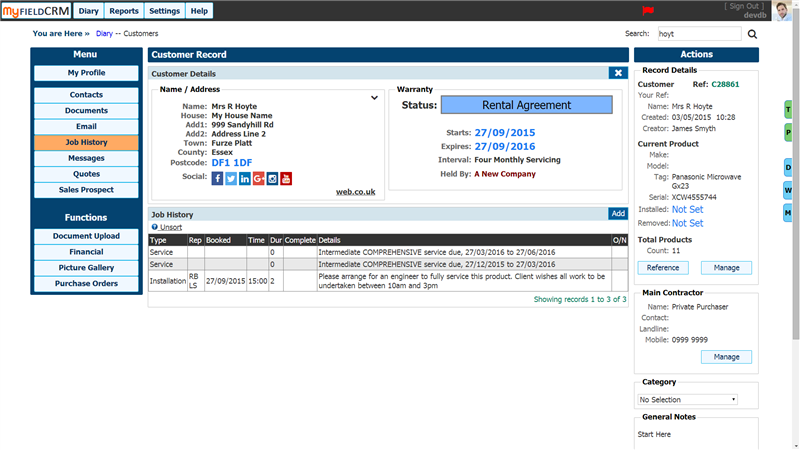 Each individual product can have its own warranty and call out / site visit history. 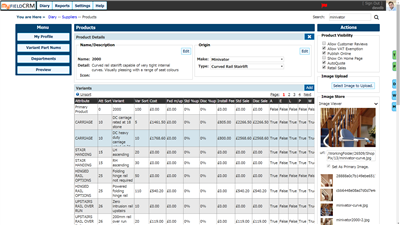 Toggle between products by simply clicking on the item within the grid. A product can have a tag name for identifying which of several similar products that the customer has purchased. For example, if we were referring to windows within a property, the tag could identify where in the building that particular product has been installed. 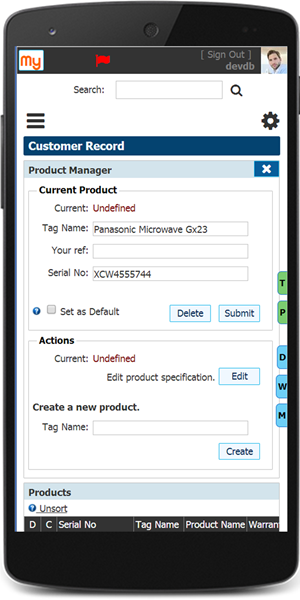 Editing tags and product names can be done from the product manager. There are no limits to the number of products that can be assigned to a customer record. Each product can have its own pricing policy. Either simply upload the product image and give it a name, or go much further into configuration of your products by giving them cost and markup values. Variants can be set up that defines each element of your product. For example, the illustrated product here is a stairlift. Each specific item can be identified and priced an an item. This information can be later used when quoting for products to your customers. 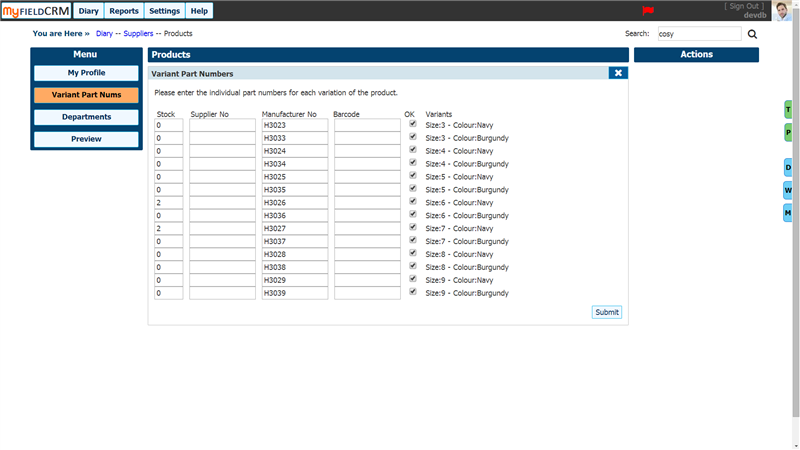 Variant part numbers are listed as a sum of the total number of permutations on the product list. 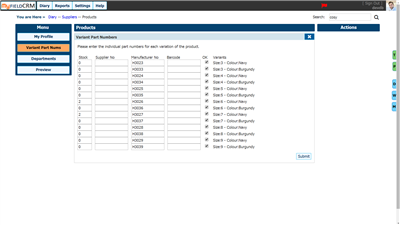 Each possible combination can be given a part number. The example shows shoes. There may be 7 different sizes, in five different colours and possibly some sizes are also available in wide fitting. All of this data can be recorded including missing out non-available items. 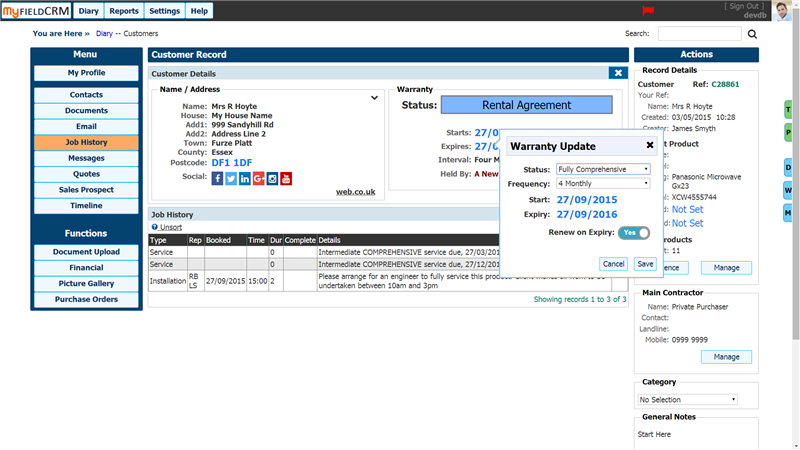 Warranty and expiry dates set within the warranty manager can trigger events for warranty renewal, warranty renewal letter generation and early warranty renewal offers. Expiry letters can be also be created for non-renewing customers. Customer warranties are set within the customer record. These can be fully comprehensive, parts only, rental etc. A frequency is set that determines how often the product is scheduled for planned maintenance servicing visits. Planned maintenance service visit entries are automatically added to the customer jobs service history, with times allocated proportionally to the frequency selected. The warranty work can be assigned to an external servicing company, which can also have its own expiry date. For example, you have offered a 5 year warranty to your customer, but the manufacturer will take care of the first year. Warranty renewal can be monitored in two ways. For a simple approach, there is an automatically generated list that shows all warranties due within the next 7 days, and expired within the last 7 days, I.E. 14 days in total for you to determine what to do. A more advanced approach allows you to define custom warranty documents for early renewal offers, first year renewal, subsequent year renewals and expiry. 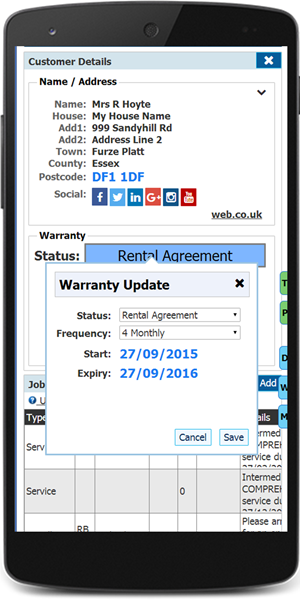 Choosing the advanced option for warranty renewal will allow you to create PDF warranty documents that are automatically assigned to each customer. Warranty documents can be printed and posted or emailed direct to the customer. The process can be monitored to maximise revenue from the warranty renewal program. 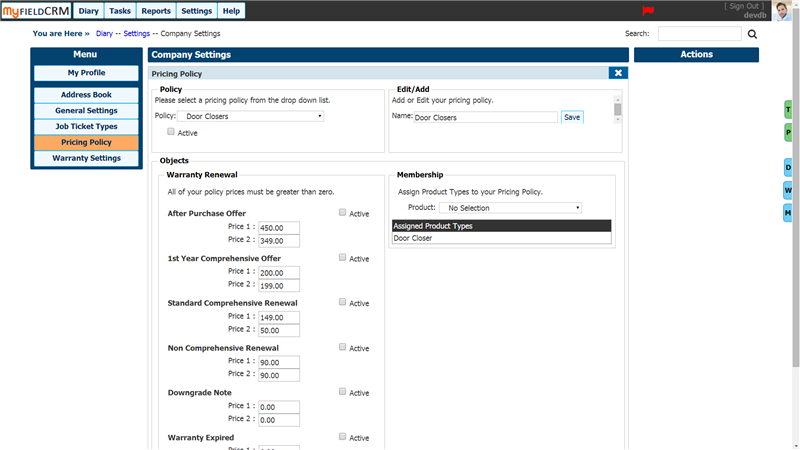 For each product type that you have, a separate pricing policy can apply for each of the warranty document stages. The pricing policy elements can be embedded within the document and automatically update to the correct price for the particular product. 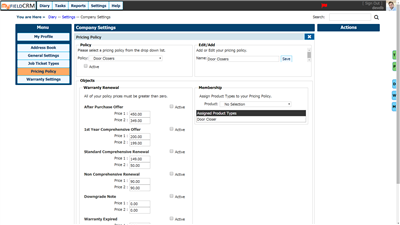 Multiple pricing policies can be set up to define differing levels of warranty for the same product based on the complexity of the installation or product specification purchased by the customer.